It’s been a busy couple of days. Thankfully, the sandblasting is finally over. At first it was pretty neat but the newness wore off in a hurry. There are still a few small parts that will require blasting, but I’ll save those for another day. I was quite happy with the job the sandblaster did on the frame, it came out looking almost new! 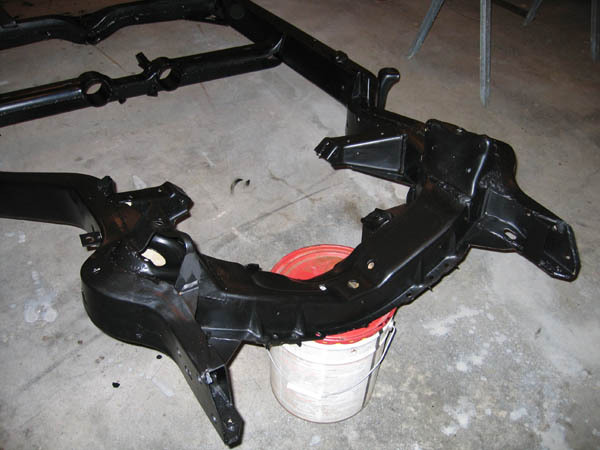 While I was sandblasting the frame I also took the opportunity to sandblast the lower control arms. I’ll have to do the uppers as well, but they were buried somewhere behind the sandblasting tent so I skipped them for now. What a difference! After fighting to get the cross shafts off for a half hour, I gave up and left them in for now. They’ll be replaced with new ones during reassembly so I didn’t blast them. There were a few areas of damage on the frame that I wanted to repair. This photo, taken when the project was just starting, shows damage to the underside of the front cross member (right below the engine). Apparently this type of damage is common and is the result of an improperly placed floor jack. Regardless of what caused it, it looks terrible and needs to go. Same spot, but after sandblasting. Here I’ve drawn some lines to delineate the area of repair. Some careful cutting using a circular saw with a metal blade made quick work of the cutting. The spot welds have also been drilled out in this photo. With the plate removed, I did some quick cleanup to the inside of the cross member with a wire brush. To help prevent future damage I decided to reinforce the area by installing a few ribs inside the frame. These should prevent the same damage from happening again in the future. They were installed such that the bottom of the ribs (this picture is looking at the underside of the frame) were flush with the bottom of the cross member flange. The replacement cover plate was fabricated from two pieces of 1/8″ thick x 4″ wide mild steel that I had in the garage. Before welding everything together the inside of the frame was given a good coating of rust inhibiting paint. After welding the two plates together they were bevel and spot welded to the frame. During installation I left the plates overhanging the existing frame edges. After the welding was finished I came back with an angle grinder to get the finished edge. The finished product. Granted, it’s not a perfect match, but not too bad considering my amateur metal working abilities. Time to move on to the frame gussets. These were installed at several locations in the front of the frame to add rigidity and prevent frame flex. 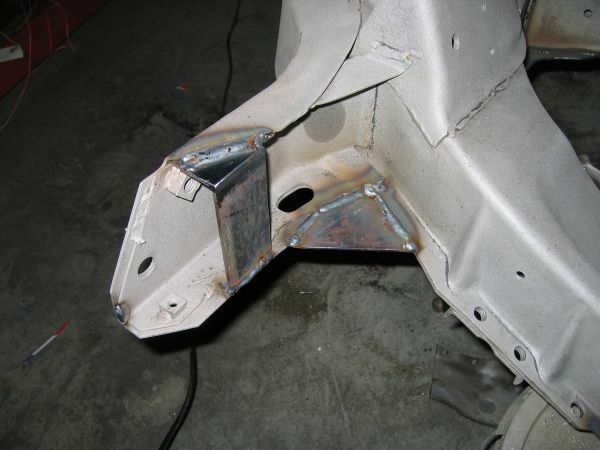 Each gusset was cut from 1/8″ thick mild steel and then welded securely in place. This gusset was coped to provide clearance for the fuel pump. Thanks to the guys on the corvette forum for the heads up! Here’s the front of the frame with all of the gussets welded in place, welds ground smooth and sandblasted clean. It’s really starting to feel like I’m making some progress now! To paint the frame I decided to go with a product called POR-15. For this application it’s a four step system. First the frame is degreased using Marine Clean, a water soluble degreaser. Secondly, Metal-Ready, a zinc phosphate solution, is applied to etch the metal before painting. 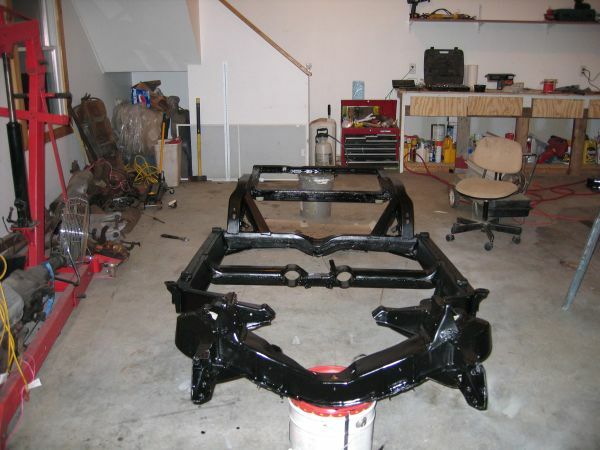 The POR-15 is applied third (two coats) and then top coated with Chassis Coat. 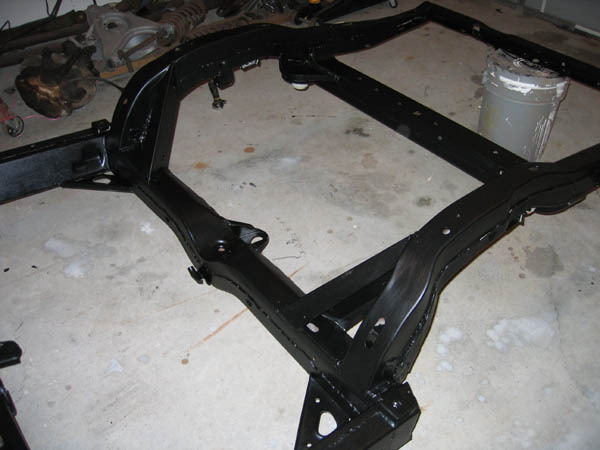 The Chassis Coat gives a black semi-gloss finish. Here the degreasing has been finished. It didn’t make much difference in the frames appearance though. I really hated spraying the bare steel frame with water, it just seemed wrong! On the bright side, it allowed me to work outside despite the drizzle. Unlike the degreaser, the effects of the Metal Ready were quite noticeable. After several hours of drying time, the frame is ready for paint! Below are a few pictures after the first coat of POR-15 was applied. I decided to apply it by brush which allowed me to get paint in the numerous nooks and crannies throughout the frame. Yes, spraying would probably have saved a little time, but there would still have been a fair bit of brush work to do. Plus after going through the first coat I think the brush did a more thorough job. Hopefully by the end of the week I’ll have the second coat on. That’s it for this update! Stay tuned for more progress!